Home > NHL Picks and News > Vegas Golden Knights NHL Hockey Betting–How Much Could You Have Made? Vegas Golden Knights NHL Hockey Betting–How Much Could You Have Made? –The Vegas Golden Knights have obliterated all records for NHL expansion teams. –The Golden Knights have improbably made the Stanley Cup Finals. –The Golden Knights play their home games in the brand new T-Mobile Arena. The Vegas Golden Knights’ story is getting downright insane. It was improbable enough when they were merely Pacific Division champions entering the Stanley Cup Playoffs with hope and vigor. Now, they’re a mere four wins away from a Stanley Cup Championship. Some context is in order–before the Golden Knights ran roughshod over the Pacific Division this season no NHL expansion team had finished their inaugural season with as much as a winning record. For that matter, neither had any other expansion team in the four major North American sports leagues. The best first year performance by a NHL expansion team prior to this season was the 1993-94 Florida Panthers who went 33-34-17 and *almost* made the playoffs. The best debut season by a NBA expansion team? The 1966-67 Chicago Bulls led by legendary Utah Jazz head coach Jerry Sloan went 33-48 and *did* make the playoffs only to get swept in the first round. The best NFL team? The 7-9 Carolina Panthers who made their 1997 debut season a memorable one despite playing their home games 133 miles away from Charlotte in Clemson’s ‘Death Valley’ aka Memorial Stadium. The best expansion debut in Major League Baseball was the 1961 Los Angeles Angels who went 70-91. None of these teams came anywhere within sniffing distance of a championship. 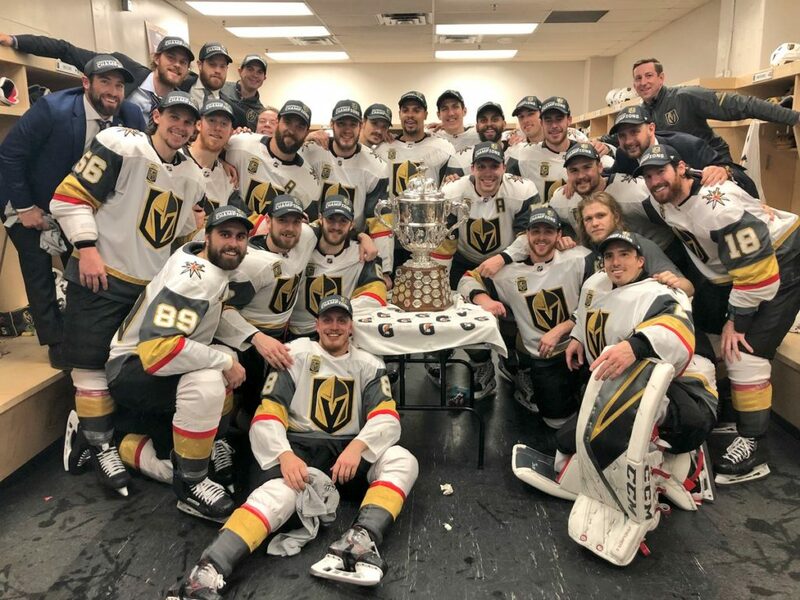 Oddly enough, the Golden Knights *aren’t* the first NHL expansion team to make the Stanley Cup Finals in their first season. The St. Louis Blues did that in 1967-68 but there’s a very significant footnote to their performance. That was the year that the NHL went from 6 to 12 teams and all six expansion teams were placed in the same division. In other words, an expansion team had to make the Stanley Cup Finals one way or the other. The mighty Montreal Canadiens made short work of the Blues by sweeping them in the Stanley Cup Finals. There’s also the Toronto Arenas who won the Stanley Cup in their debut season of…1918. That year there were four teams that started the season but only 3 teams that finished the year as the Montreal Wanderers folded midway through the 22 game campaign. The Arenas won the two game finals over the Montreal Canadiens on ‘total goals’. MSN Sports did a feature where they highlighted ‘The best inaugural season for expansion teams‘ in a slideshow. They really had to scrap to come up with some expansion teams that had a winning record in their first year of assistance. The Major League Soccer (MLS) Seattle Sounders went 12-11-7 in 2009 but lost in the first round of the playoffs. The 1925-26 Pittsburgh Pirates hockey team went 19-16-1 in their first year in the NHL and even made the playoffs, losing to the Montreal Maroons in the first round. At this point, the NHL had seven teams and was a completely different sport so that doesn’t really count. The 2017 Atlanta United MLS team went 15-9-10 in their first season. The 1994 Baltimore Stallions–they had to accept that horrible name after losing a legal battle with the NFL over the ‘Colts’ nickname–went 12-6 in their debut season during the Canadian Football League’s ill fated ‘US expansion’. They made the Grey Cup Championship Game where they lost to the BC Lions on a field goal with no time remaining on the clock. Two years later, they’d move north and become the Montreal Alouettes. They conclude with the 1998 Chicago Fire soccer team which won the league championship during their first season in the MLS. WHAT IF YOU HAD JUMPED ON THE GOLDEN KNIGHTS BANDWAGON EARLY? Just before the expansion draft I did a list of Vegas Golden Knights prop bets and set their Over/Under win total at 24.5. After the draft, I elevated my expectations somewhat based on what I thought was a very impressive assortment of talent the team acquired. At that time, I bumped their O/U win total to 30.5. Right before the playoffs started I did an article reviewing the Golden Knights prop bets to see how much you could have won if you had been appropriately ‘bullish’ on their debut season performance. Now that they’ve reached the Stanley Cup Finals we have to do an update. Here are the rules–in each proposition wager we’ll assume that you bet $100 on the outcome most favorable to the Golden Knights. For example, in the previously mentioned O/U win total you would have bet the ‘Over’. VEGAS GOLDEN KNIGHTS 2017-2018 WIN TOTAL? RESULT–WIN +110: The Golden Knights simply obliterated both numbers. They have 51 wins at the time of this writing but here’s the *really* crazy thing–the Golden Knights went ‘Over’ this total before the end of 2017! Vegas won their 25th game on December 28, 2017. This one was never in doubt. To make their performance all the more impressive–the Golden Knights have won 25 more games *since* then. WHEN WILL THE VEGAS GOLDEN KNIGHTS WIN THEIR FIRST REGULAR SEASON GAME? RESULT–WIN +100: The Golden Knights didn’t wait around to cash this ticket–they took a 2-1 win at Dallas on opening night and got their first home win three days later as they prevailed 5-2 over Arizona at the T-Mobile Arena. WHERE WILL THE VEGAS GOLDEN KNIGHTS WIN THEIR FIRST REGULAR SEASON GAME? RESULT–WIN +250: Vegas came out of the gate strong, winning their debut at Dallas. They would go on to start the season 8-1-0. NUMBER OF PLAYERS FROM THE VEGAS GOLDEN KNIGHTS TO MAKE THE 2017-2018 NHL ALL STAR GAME? RESULT WIN–+150: 2 players from the Vegas team were named All Stars: Goaltender Marc-Andre Fleury and forward James Neal. NATIONAL WEATHER SERVICE TEMPERATURE AT MCCARRAN INTERNATIONAL AIRPORT AT THE TIME OF OPENING FACEOFF PUCK DROP FOR THE VEGAS GOLDEN KNIGHTS FIRST REGULAR SEASON HOME GAME? NO RESULT: I’m not going to count this one in our results rundown simply because there’s not a ‘Golden Knights favorable’ position to take. FWIW, it was 73 degrees at the time of the opening faceoff for the first NHL regular season game in the 702. WILL THE VEGAS GOLDEN KNIGHTS MAKE THE 2017-2018 STANLEY CUP PLAYOFFS? RESULT–YES +700: What was something of an ‘impossible dream’ before the season quickly became all but a foregone conclusion. In a down year for the Pacific Division the Golden Knights looked like a lock for this one before the start of 2018. WILL THE VEGAS GOLDEN KNIGHTS FINISH 2017-2018 WITH THE BEST RECORD IN THE PACIFIC DIVISION? RESULT–WIN +3750: Amazing. Not only has Vegas clinched the Pacific Division title they’ve got an 11 point lead over second place San Jose. They’re also one of only 7 teams in the NHL with more than 100 points. WILL THE VEGAS GOLDEN KNIGHTS FINISH 2017-2018 WITH THE BEST RECORD IN THE WESTERN CONFERENCE? RESULT–LOSS -110: Their only loss so far on my list of Golden Knights props. Spoiler alert–they get this back soon enough. WILL THE VEGAS GOLDEN KNIGHTS WIN THE WESTERN CONFERENCE PLAYOFF CHAMPIONSHIP AND ADVANCE TO THE STANLEY CUP FINALS? 2017-2018 AVERAGE ATTENDANCE AT VEGAS GOLDEN KNIGHTS HOME GAMES? So much for Las Vegas’ potential as a ‘hockey town’. The official capacity for hockey listed on the T-Mobile Arena website is 17,500. The Golden Knights averaged 18,042 per game sailing over both of the attendance totals. 2017-2018 AVERAGE PERCENTAGE OF CAPACITY AT VEGAS GOLDEN KNIGHTS HOME GAMES? WILL THE VEGAS GOLDEN KNIGHTS SELL OUT THEIR FIRST REGULAR SEASON HOME GAME AT T-MOBILE ARENA? The Golden Knights percentage of capacity to date is 103.9% which is fourth in the NHL behind Chicago, Minnesota, Washington. Opening night was a sellout. At one point, UNLV basketball was the ‘biggest game in town’ but the Runnin’ Rebels program has fallen on hard times. This one wasn’t even close. So let’s tally up the results. We had 13 propositions where there was a clear position favorable to the Golden Knights. They nailed a 12-1 record producing a whopping 130.10 units of profit. $100 on each of these positions would have turned a profit of $13,010. They might not be done yet. The only thing they didn’t do was finish with the best record in the Western Conference–they had the third best record (109 points) behind the Nashville Predators (117 points) and Winnipeg Jets (114 points). Then again, the Predators and Jets will both watch the Stanley Cup Finals on television. Winning the Western Conference playoffs and advancing to the Stanley Cup Finals was worth another +7500. And should Vegas do the unimaginable and win the Stanley Cup they’d cash a +15000–at least based on my preseason numbers. Some Vegas sportsbooks had them at odds as high as +50000. Should the Knights win the Stanley Cup there’s an excellent chance that Marc-Andre Fleury would be win the Conn Smythe Trophy as playoff MVP. He was +2000 to earn this award at the end of the regular season. William Karlsson was +2500 to win the Conn Smythe and ‘Any Other Player’ besides the group I listed was priced at +5000. Jonathan Marchessault has also been excellent during the postseason and he would be in the ‘Any Other Player’ category.